A Spanish teacher at Dallas ISD’s Thomas J. Rusk Middle School won an award at the recent national foreign language conference, and was also invited to serve as a keynote speaker during the conference’s Assembly of Delegates. Akash Patel received the Leo Benardo Award for Innovation in K-12 Language Education from the American Council on the Teaching of Foreign Languages (ACTFL). In front of the 500 delegates, he was asked to discuss dealing with the national teacher shortage and what drew and keeps him wanting to teach. His interest was sparked when he discovered a lack of teaching in schools centering on global citizenship and cultural awareness. Without that focus, stereotypes, biases and bigotry are often perpetuated, he said. To further connect classrooms around the world, Patel and Amy Anderton, director of Dallas ISD World Languages, helped launch the nonprofit Happy World Foundation. 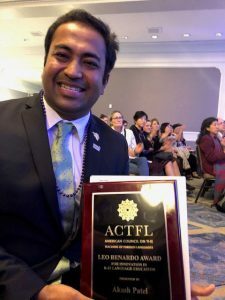 The organization provides resources to teachers to connect them to other classrooms around the world and awards scholarships to students for them to study language in this country and beyond. The ACTFL conference was conducted in November in New Orleans. Earlier this year, Patel was nationally recognized as one of the top 50 finalists for the Global Teacher Prize, which recognizes a classroom teacher who exemplifies global citizenship teaching and learning – and comes with a $1 million award.